Sometimes things just line up. That’s clearly what happened in 2007, when moviegoers were treated to a calendar year full of undeniable excellence on screen. Some of these great films were recognized almost immediately, others have gradually garnered appreciation over time; but as we stand ten years later, 2007 remains one of the standout years for movies over the last few decades. Throughout 2017 I’ll be periodically going back to take stock of what made these movies so impressive and how they hold up today. It was in August 2006 that the two best films of the following year met briefly in the small desert town of Marfa, Texas. Production overlapped there for a time, with the two film crews shooting in close proximity. So close, in fact, that the smoke from There Will Be Blood‘s oil derrick explosion scene forced directors Joel and Ethan Coen to suspend shooting for the day on their upcoming masterpiece, No Country for Old Men. I don’t know why this little movie trivia factoid fascinates me so much. Perhaps it’s because less than two years later, these two films would face off at the Academy Awards, with the Coens’ work taking Best Picture, Best Director, and Best Adapted Screenplay over Paul Thomas Anderson’s There Will Be Blood. Or perhaps it’s the irony that a movie that traffics so deeply in themes of fate and predestination seems like it was fated to cross paths with 2007’s other masterpiece. Fate or not, No Country for Old Men deserves to be appreciated on its own. After ten years, this movie still stuns me like Anton Chigurh’s cattle gun. Before the film was released, pairing Cormac McCarthy’s stoic prose with the Coen brothers’ quirky sensibility seemed like a strange choice. 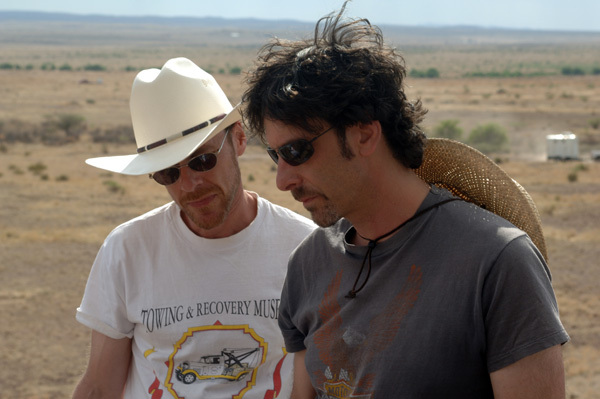 It’s worth remembering exactly where the Coens were in their careers before No Country. They had an impressive run of respected work throughout the 1990s (Miller’s Crossing, Barton Fink, Fargo, and The Big Lebowski), only to hit a bump in the road with a couple of disposable oddball comedies in 2003’s Intolerable Cruelty and 2004’s The Ladykillers. With those two disappointments as their most recent work, they didn’t seem like the type to make a neo-Western masterwork in 2007. Surprisingly, the Coens agreed to adapt McCarthy’s novel just months after it was published in 2005. It would be their first straight adaptation of a book (O, Brother Where Art Thou? was loosely inspired by Homer’s Odyssey). While the Coens and Cormac may not have seemed like a natural fit at first, in hindsight it makes all the sense in the world. First of all, the Coens had done the “an incomprehensible evil invades an idyllic setting” type of movie before to great effect with Fargo and their first feature film Blood Simple. The latter is the better precursor to No Country, with its sun-scorched Texas background and noir influences. Second, some of McCarthy’s dialogue has a dark wit and humor to it that is rendered perfectly deadpan onscreen by the Coens. Lastly, McCarthy’s philosophizing on fate and predestination and evil is balanced out by the Coens’ sense of irony. The great American novelist from Tennessee and the cinema-obsessed brothers from Minnesota ended up complementing each other in fascinating ways. One of the many things the Coens did flawlessly with No Country was the casting. I mean, every choice is sublime. Tommy Lee Jones is note-perfect as Sheriff Ed Tom Bell. 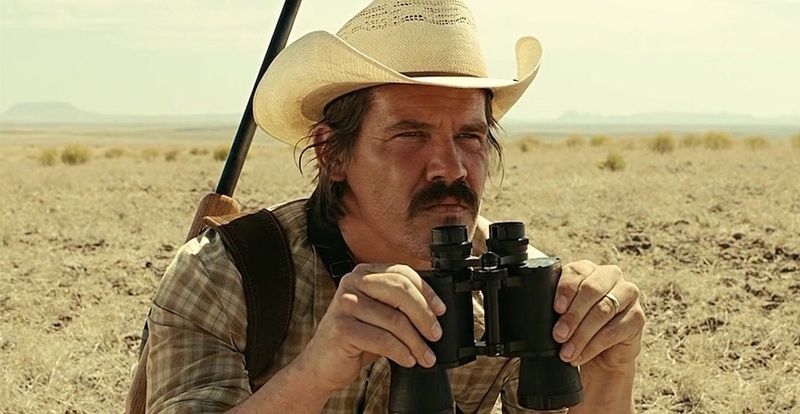 Josh Brolin gives career-best work as Llewelyn Moss, who foolishly takes the suitcase of money that sets off the plot. Kelly Macdonald and Woody Harrelson are memorable and well-cast in pivotal supporting roles. And then there’s Javier Bardem’s Chigurh, who will go down as an all-time great movie villain, which is no simple achievement, particularly with that haircut. Despite stellar acting all around, this is Bardem’s showcase. When we’re first introduced to Chigurh, we see him strangling a police officer who just hung up the phone with some ominous last words: “I got it under control.” He doesn’t. Seconds later, Chigurh unleashes savage violence upon him, snuffing the officer’s life out with the expression of a deranged chipmunk. In the very next scene, we see Chigurh calmly pop a clean hole through a man’s head with his cattle gun just so he can take his car. Whether it’s with brute force or efficient marksmanship, witnessing Chigurh’s psychopathic capabilities right away leaves us terrified of what he will do next for the rest of the film. The first time you see this you’re not sure whether to laugh or curl into the fetal position. I didn’t know you could refer to someone as “friend-o” with such pure menace. This is the scene where Chigurh’s philosophy starts to take shape. He’s an amoral, nihilistic monster that doesn’t believe in anything but random chance. When striving to understand the end of No Country, this becomes important. Perhaps what makes Chigurh even more frightening is that the Coens don’t give us any musical cues as an emotional guide. No Country has a score, but it’s used so sparingly it might as well not be there at all. Especially in Chigurh’s scenes this becomes relevant to his outlook on life. As he delivers deadpan threats and kills with impunity, there is just an indifferent silence in the background, kind of like the cold, sound-less void of outer space. What’s amazing is that, despite a minimalist score and a measured pace, No Country is still highly suspenseful, no matter how many times you’ve seen it. This is to the Coens’ credit. Ten years later, scenes like the Llewelyn-Chigurh hotel chase scene are as riveting as ever. And then there’s that ending — confounding and frustrating to some, brilliant and timeless to others. I think it will continue to age like fine wine, unlike a more conventional ending. It’s not just that the assumed main character (Brolin’s Llewelyn) gets killed; that felt inevitable throughout the movie. It’s that it happens offscreen and it’s not even Chigurh who does it. Llewelyn thinks he can control his own fate and outrun what’s coming for us all, thus revealing the fool’s errand in humanity doing the same. This may feel like a nihilistic ending, one in line with Chigurh’s view of the universe as indifferent and random, adhering to the whims of a coin toss. With each viewing, this ending becomes more powerful. After we just saw an unfathomable evil lead to the deaths of Llewelyn, (likely) his wife, and several others, and after that same evil escapes with with his life (and a gnarly broken arm), hope peaks out at the end of No Country. Even when the world cruelly seems like it’s dark and cold, we still have that yearning for the light and warmth that may be waiting for us beyond. Of course, the last line of the film is “And then I woke up,” which leads us to question if the fire amidst the dark and cold is real or an illusion. Is nothingness all there is? Or will we find that fire awaiting us? This is part of why No Country for Old Men feels so timeless. Its philosophizing isn’t preachy or condescending, just unassuming and inquisitive. It sends you away with plenty to think about, while providing a gripping piece of entertainment along the way — exactly what great cinema is supposed to do.